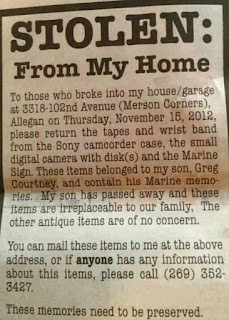 Simply Raising 8: Marines Father Wants His sons memories back from Burglar please share this post! 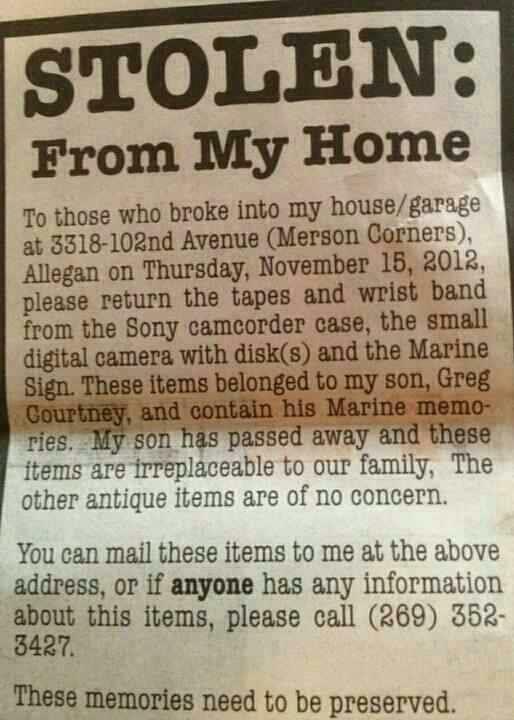 Marines Father Wants His sons memories back from Burglar please share this post! As you can see by this ad posted in a local paper a young Marines life was lost. Disks with his memories were stolen from his family when it was recently burglarized. You can see the article on M-live by clicking here. I would love to see this family get these back for Christmas. If you know anything, please find it in your heart this holiday season to call the number with information. Please share this story also. There were other items that were stolen with the camera that were antique and although they may not want them back they may be of help in finding the person who has the camera and pictures, so that they may be returned. The number is (269) 352-3427 I am just re-posting this as I hope you will to help get the word out.